Welcome back to another Trash to Treasure series!! 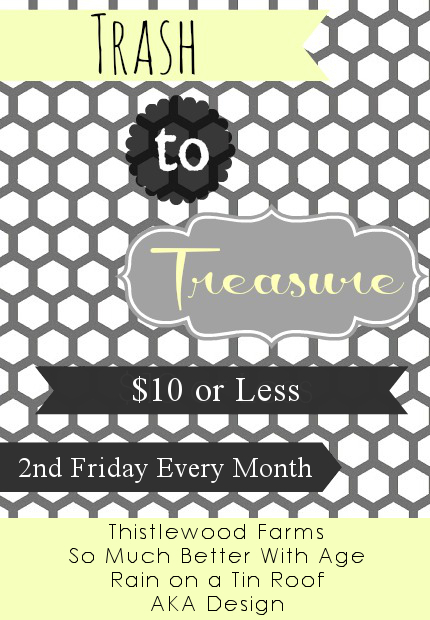 Every month (2nd Friday) we take a “trash” item and turn it into “treasure”. 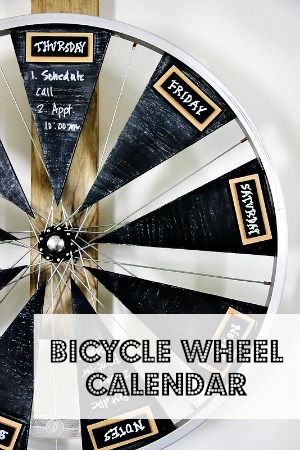 Be sure to follow my co-hosts, Karianne, Jenna, and Shannon at the end of this post! So I have a lot of wicker throughout my house. I’ve had some of it going on 10 or 15 years or more! That’s a crazy amount of time for wicker to last, really. 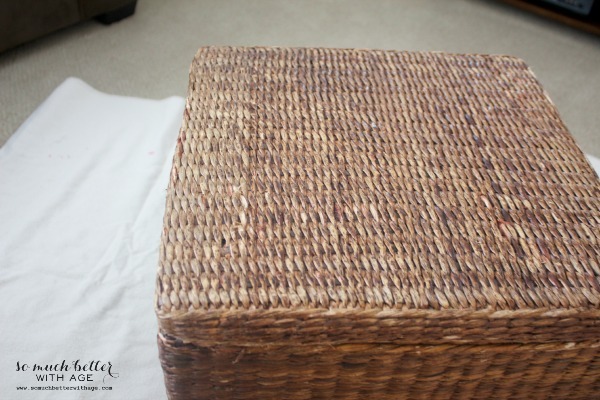 I had this wicker cube and it was getting pretty worn and I was thinking of sending it off to charity when I thought I could revive it somehow for this T2T series. I decided to paint it a grey, a driftwood grey. Yep, I totally just made that up. 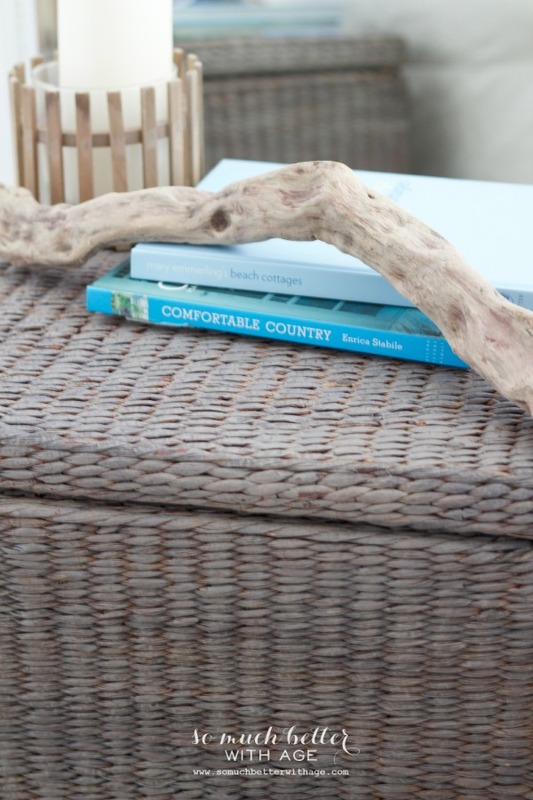 I’ll show you this easy paint technique to transform wicker to look like driftwood. 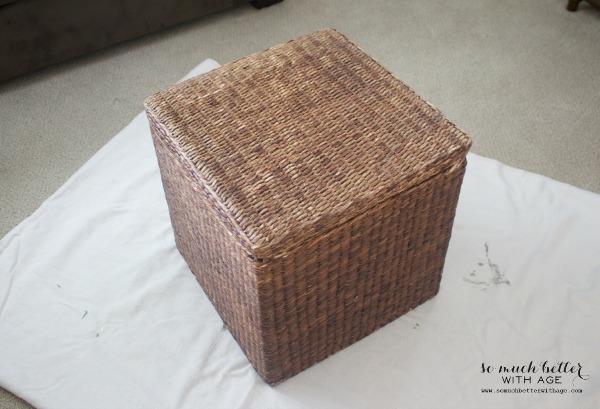 So here is the wicker cube. It has a lid so you can store stuff inside. I was storing my kids playdoh in it and sometimes we would even use it as a stool so I’m amazed at how well it’s held up. It’s seem better days, though, and the sun has bleached in in some areas. 1. 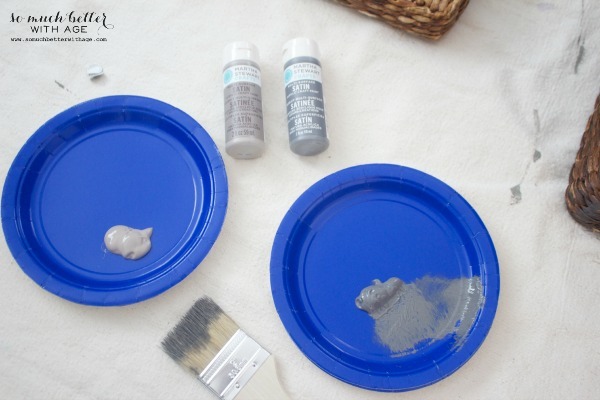 Put a dab of paint on a paper plate. Dab your chip brush into the dark paint first (I used MS Arrowhead) and wipe the excess off. 2. 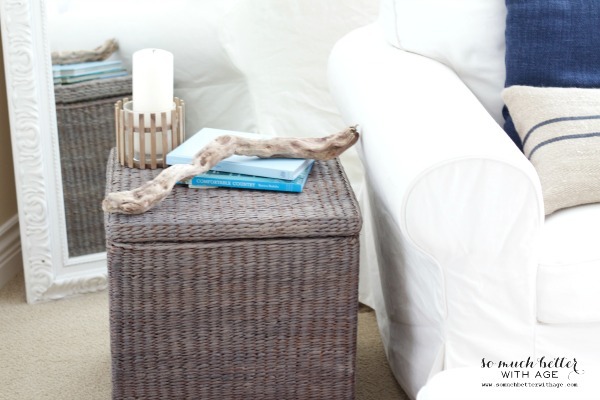 Paint a light coat of the darker grey paint all over the wicker. Don’t worry about getting into all the cracks. It’s nice to see that dark wicker color show through at the end! 3. 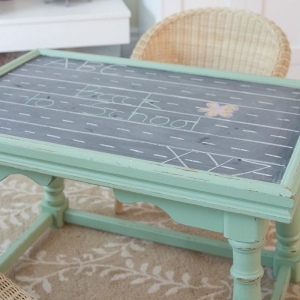 Once you’re done that first coat of paint, it should be dry where you first started (dries fast!). Take the lighter grey paint (I used MS Gray Wolf) and dry brush over the grey paint. 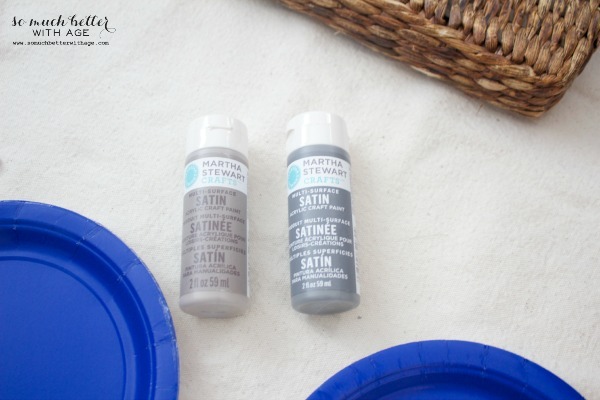 Use a tiny bit of paint and wipe excess off on a paper towel or edge of paper plate. There will be less of this lighter grey paint going on than the darker paint. 4. 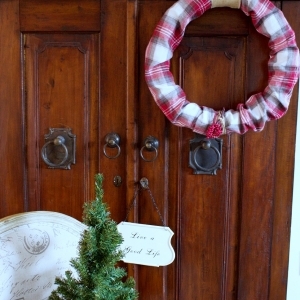 If you make a mistake or want it a bit lighter, use paper towel to wipe off excess. You can use a wet paper towel if you need to get a lot off. Repaint that part again if you took too much off! Foolproof! 5. That’s it! My plan was to lightly sand it down afterward so you’d be able to see all the colors but I didn’t need to. The colors just shown through. 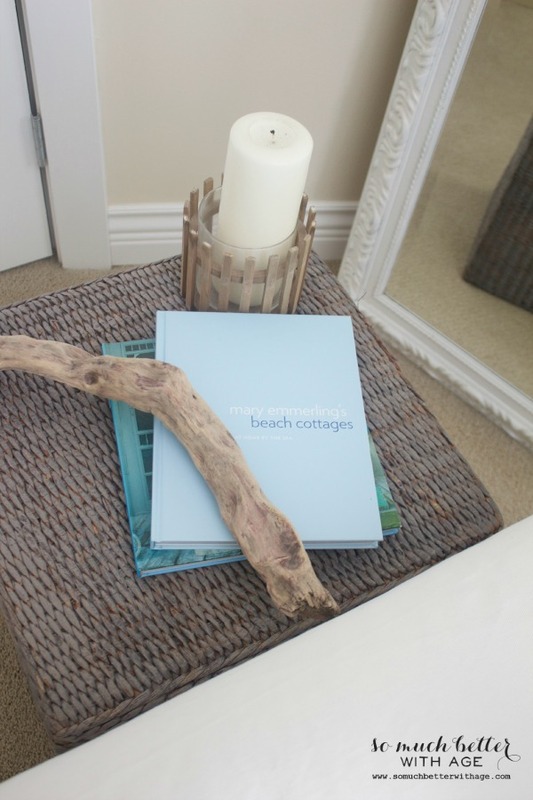 Feel inspired to paint some wicker driftwood grey? 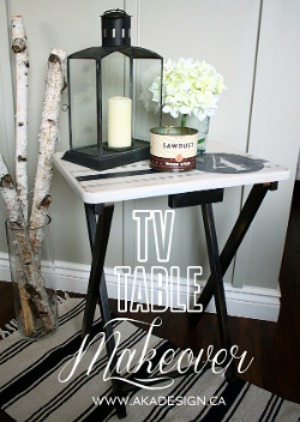 Be sure to check out what my co-hosts did for their Trash to Treasure projects! 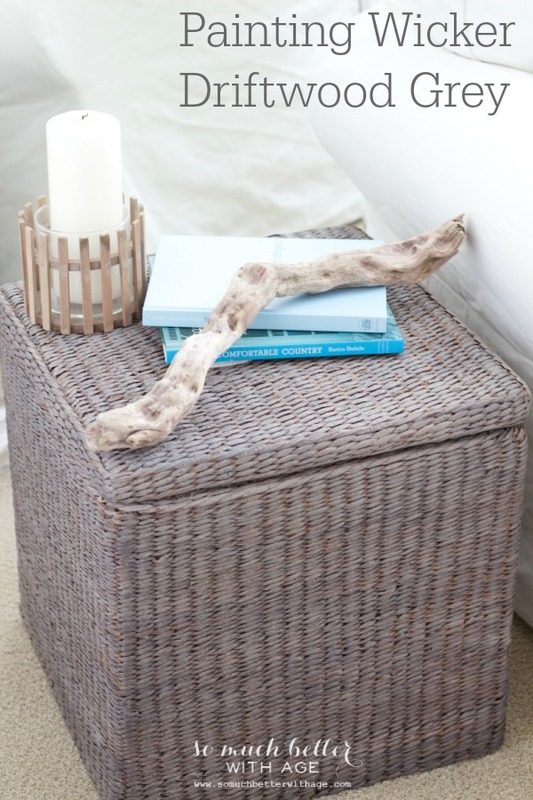 I have some wicker boxes that are good quality, but I loathe the color. Never thought of painting them, and now I’m inspired to give it a whirl. Enjoy your weekend! Glad I inspired you, Shauna! Pretty! I have a lot of baskets that are a similar color to your cube (the original color, that is!) and it would be fun to paint a couple of them to break up the uniformity. Great job! It’s so easy, Chaney. I only wish I did it sooner! I love that! 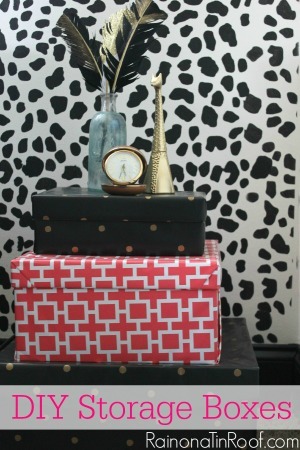 I’m pretty sure I have the exact storage ottoman. 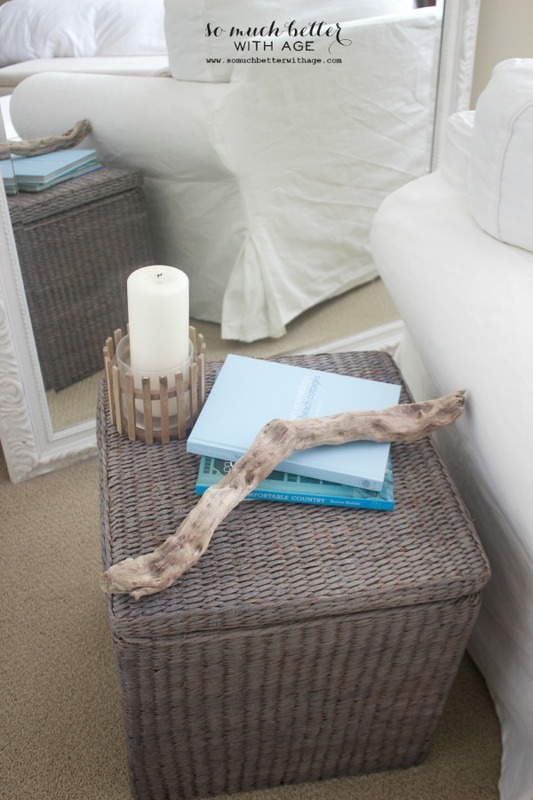 I use it as my vanity stool and keep our bed linens in it (we have a tiny master, every piece of furniture does double duty!). It is starting to fade and fray though, it’s good to know it will take paint! Thanks for sharing. I’m surprised how well my has lived up but yeah, it fades. It takes paint soo well! Hope you try it! This turned out great! Love the colors. There is a stain called weathered gray that looks very similar. Would that work as as well? I would think on wicker since it is woodish it might and there is no mixing involved. I have down several graffiti signs with it as my base bc my living room is gray. I am obsessed with that color right now! Laurie, that sounds amazing! It might work well! I think it will depend on the finish of your wicker. Mine seems to have a bit of a sheen to it so it makes me think there was some sort of shellac or varnish on it, I don’t know. It would be worth trying it in a small spot first. What brand is the stain you are using. I love the look. Thank you for sharing the process and the finished product. Your basket turned out lovely! Love the grey. Beautiful! Those color choices combined perfectly! Love it! I need to try this on a huge basket I’ve been holding on to. Thanks Nicole, you’ll love it! Pretty and easy! Thank you for the inspiration. I love your slipcovers, been dying to sew my own. Did you make them? I love how this turned out! Thanks for the tutorial! I pinned it! Hi Jamie!!! 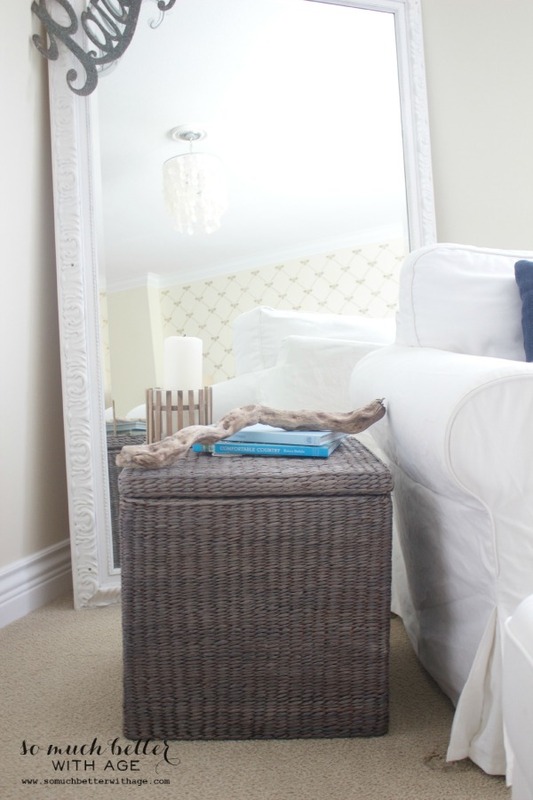 LOVE your wicker makeover. Your cute driftwood cube was the most view paint project last week and will be featured tomorrow night at the Power of Paint Party! Thanks for linking up! 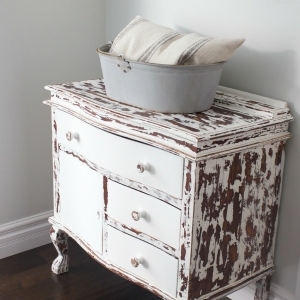 I have a wicker chest, I have never thought of painting it, this is inspiring. Please come share at the Anything Goes linky, if you have not already. I love the new updated color! I love the idea. But what if it gets wet? Like outside? I have been wanting to paint a woven wicker-type chair to a coastal blue. 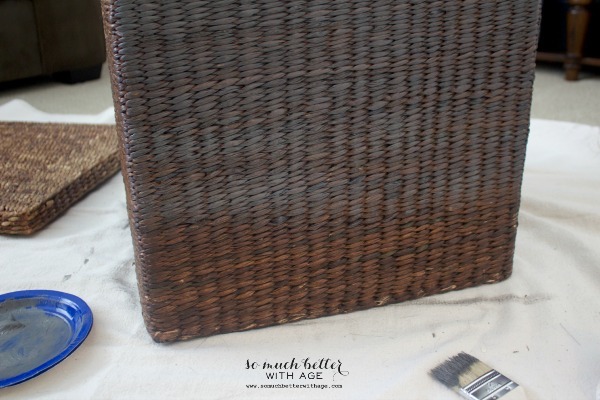 I read on BHG that acrylic paint works well for wicker stuff because it’s flexible and so forth. I am wondering how well your paint has held up? I’m not necessarily looking for 10 years of wear time but something durable. Thanks! It’s held up great! Yes acrylic paints work best. I painted this years ago and it still looks great. This looks great! I inspired. 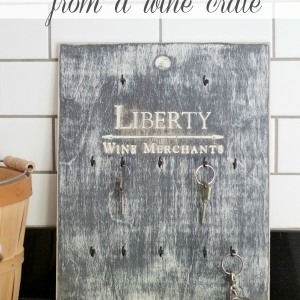 I have a small wicker dresser I’d like to do this to. Do you think I can start with the grays and then add brown at the end to create the “driftwood” look, or should I paint the piece brown first? Yes, absolutely! Try it! I’m sure it will work the same. There is nothing worse than buying new furniture and you want to paint it, I get it. But it’s better to love them then just having to ‘deal’ with it, right?! I’m not sure if you’ve painted them yet, but they will need minimal paint to get a washed look. 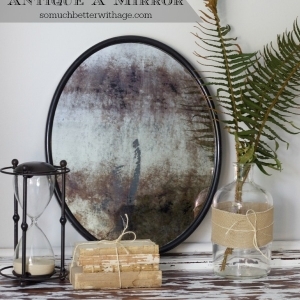 You could start with a small amount of paint over it, a wash of water and paint mixed together (1:1 ratio) and see if you like that then add more as you go. I’m not sure if you have cushions for the seats but it might help with keeping the paint fresh on the seats. 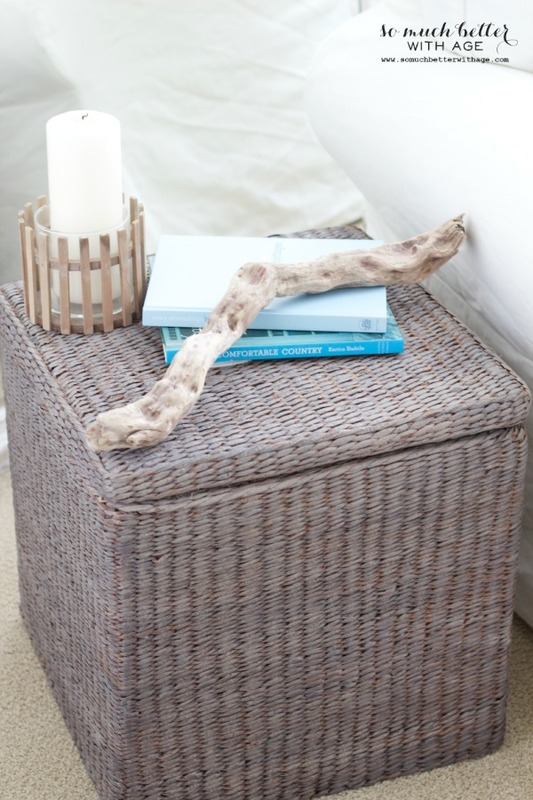 I’ve had that wicker cube forever and this post is 4 years old and it still looks great! I like how some of the brown wicker shows through too. Hope this helps! I do not find it grey enough, will a second layer help? You can definitely add a second layer. As long as you’re not putting too much on your brush, you can go over it many times until you get the right effect.